Kings North is must-play golf course, excellently maintained. The layout is fantastic, lots of water, lots of tee choices. Most important thing is that there are MANY memorable holes. King’s North is a great test of golf and is beautiful in the process. The course has really gone the extra mile making the course pretty as well as playable. Standout holes are the 6th (The Gambler) and the 12th and the signature par 3 on 11 with the island green ! A challenging layout for all handicaps of golfers. Lots of water and sand. The 4th, 7th, and 17th holes are enjoyable. The pace of play on course is completely acceptable. This sensational Arnold Palmer signature course was recognized among America’s Best New Courses when it opened in 1996. King’s North made its way onto Golf Digest’s prestigiuos list of “America’s 100 Greatest Public Courses- 2004” and Golf Digest’s “Places to Play” has awarded it 4.5 STARS ever since! Plus, from 2000-2004 Golf for Women ranked it their “Top 100 Courses in America”, truly a must play in the Myrtle Beach area. The six hole is a unique challenge where the risk could meet the reward! The Real Question is are you Ready for the Gambler? We customize the best packages so don’t delay booking early can save you more money. Let us do the work and you just save money. Just submit a quick quote and you on your way to discounts. Book a tee-time for Myrtle Beach National Kings North or another course in the area we have great rates and service. Search now if your looking to book one or a couple tee time otherwise use the quick quote for a golf package – you will save more money getting our package prices. 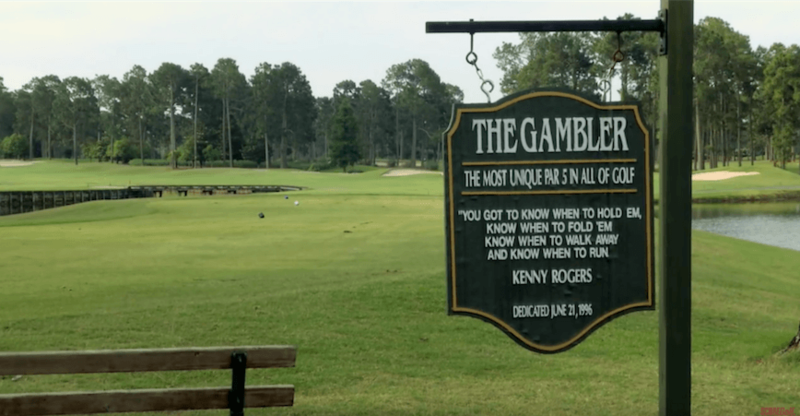 The six hole on the course is “known as the Gambler” – it is a “true test of skill” and a lot of fun. This hole is a par 5 and stands out because of its risk reward challenge. This is a testament to Kenny Roger’s phase “you got to know when to fold EM, Know when to walk away and know when to run” Kings North includes many memorable holes uniquely designed to keep most golfers on their toes. This is our favorite course. Great layout and nice pace. Our group has been coming to Myrtle Beach for Many years and even though the group of players has changed our course list pretty much stays the same and Kings North is always on the list. I guess you could say we love this course. And even though last year the course was in the best of shape due to the weather we are glad we played it this year. It was in great space and nice weather. We booked very early this year about 9 months in advance for a great package deal and have been looking forward to our annual Spring trip all winter and it did not disappoint. We absolutely loved Kings North Course and the club where we enjoyed lunch. First round first day in Myrtle and starting off well. Nice course- great layout. The only thing was the food in club house is limited. My son and I have been golfing together since he was 9 so I thought it would be nice to surprise him with a round at Kings North. It has been on his list for awhile and I knew this would impress him. We had a great time and he really did love it. I found it is a great way to spend time with your kids. Really a beautiful golf club nice layout and beautiful club house. We play this course every time we are in the area as my wife loves it. My first myrtle beach national course and my wife and I really enjoyed. Definitely impressive course but unfortunately it is a little wet. We all enjoyed this course. It has very interesting holes. We decided to golf over the holiday and decided to golf at Kings Norths and nice choice. I have played grand dunes many times and decided to try kings north and definitely enjoyed but I think I like grand dunes better and it mainly may be about grand dunes water views I love the views. The course layout was nice and challenging but unfortunately we had a really rude customer service – I guess you can’t ask a question. I thought that was what customer service was all about. Nice conditions even after the storm.